At the behest of LA Clippers coach Doc Rivers, the wife of banned owner Donald Sterling sits courtside. She really shouldn’t. I couldn’t understand why Rochelle Sterling, the wife of deposed racist owner of the Los Angeles Clippers Donald Sterling, was sitting courtside for the Clippers dramatic game 7 victory over the Golden State Warriors. After all, Donald Sterling, as NBA Commissioner Adam Silver said, wasn’t being banned for just one set of recorded comments, however offensive, but for a “pattern of behavior.” Silver did not spell it out, but it was assumed by everyone with a working cerebrum that by “pattern of behavior,” the commissioner was referring Sterling’s years as a slumlord. After all, he had been cited repeatedly by the Justice Department for violating the Fair Housing Act and, according to court testimony, spoke about black, Latino and Asian people in a manner that would make Archie Bunker blush. If this “pattern of behavior” cemented Silver’s resolve to ban Donald Sterling, then why is Rochelle a k a “Shelly” still attending Clippers games? After all, she was also named in these lawsuits and accused of abusive racist language similar to her husband’s. Ms. Sterling denies ever trafficking in racial slurs, but far more damningly, has also been captured on video illegally entering the homes of people in the Sterling tenements by impersonating a health inspector. As “health inspector,” she asked for and recorded the ethnicities of their tenants. (The Sterlings were big on racial quotas for their housing projects.) Even if she were an actual health inspector, and not just playing one on the Internet, this is illegal. Given Donald Sterling’s demonstrable misogyny, I’m sure these sixty years of marriage have not been easy for Ms. Sterling. But these personal travails don’t excuse business practices that are racist and beyond the pale. So, once again, why was Shelley Sterling courtside? Why was she leading cheers, embracing players and playing the role of embattled but brave cuckqueen: a veritable “Good Wife” of the hardwood? It turns out that this was the doing of Clippers coach Doc Rivers. It’s a tough one for Shelly, really. She didn’t do anything wrong. You have compassion for her. I kept hearing about the girlfriend, and Shelly’s the wife. You know what I mean? I talked to her today, and she’s been through as much as anyone as well. She asked if she could come, which I thought was a very nice gesture, and she just wanted the players to know that she loved them, and she told me to tell them. I thought, why not? Rivers has been praised effusively throughout this whole process for his class and grace under pressure, keeping his team together amidst the swirl of distractions. Yet if this embrace of Rochelle Sterling is a mistake, painting her as a tragic figure is obscene. 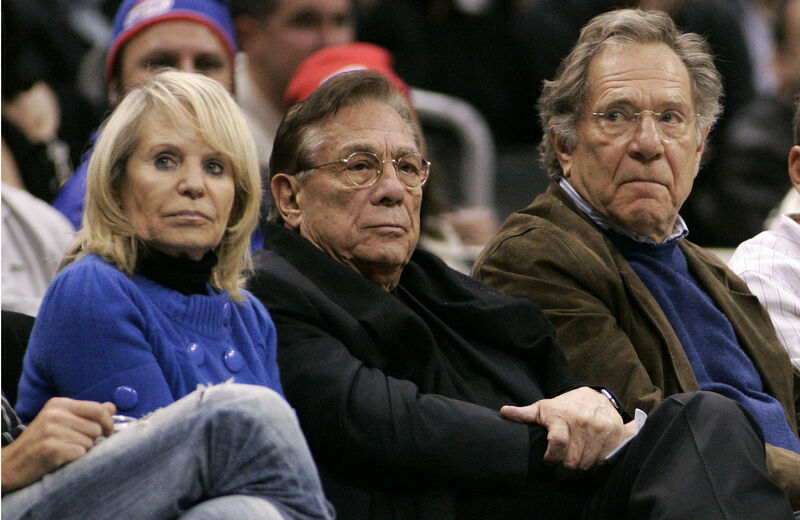 It is not as if Doc Rivers, at this point, is unaware of the Sterlings’ history. He said earlier this week that he “probably should have” researched more into Donald Sterling’s past. He should also know more about Shelly Sterling’s hands-on tenement management techniques, as they’ve received extensive coverage this week in the local LA media. By coddling Ms. Sterling, Doc Rivers sends a message that the hounding of thousands of the poorest residents in Los Angeles is a lesser crime than being caught on audio being a racist jackass. It is still possible that Rochelle Sterling will end up as owner of this team. Adam Silver left that loophole open in his press conference by not guaranteeing that the team would leave the clutches of the Sterling family. Even if the NBA appoints an interim CEO for the team, that is no legal guarantee this will end with the Sterling family on the outside. One wonders if the highly litigious Donald Sterling would dangle a transfer of the team from himself to Shelley as a compromise to keep thirty years of NBA dirty laundry out of open court. But in the short term, her presence at games is like a looming reminder that when the smoke has cleared, one Sterling has been merely replaced with another. Ironically after the Game 7 victory, Doc Rivers gave a passionate speech in which he said, “We needed that. The adversity is good for us.” If adversity is what they want, then coddling Rochelle Sterling guarantees more of the same.